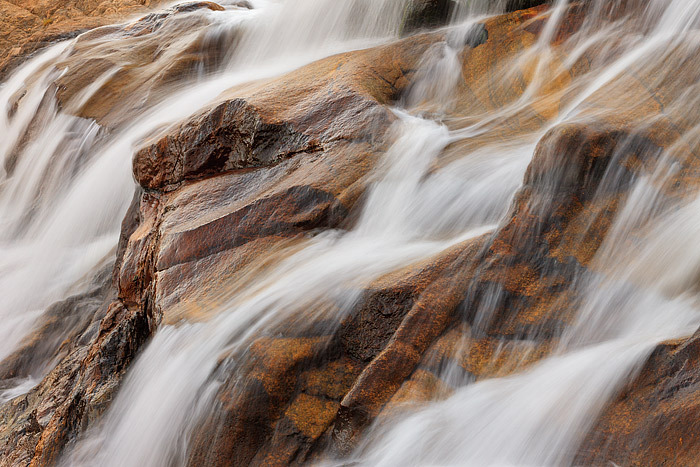 The rushing cascades of the Roaring River have helped to smooth and define the red hued rock that now makeup Alluvial Fan Falls in Rocky Mountain National Park. Though Alluvial Fan Falls was created when a man made dam failed at Lawn Lake, watching the water channel through and over the rocks is as serene and peaceful as any place in Rocky Mountain National Park. Photo © copyright by Thomas Mangan.